Lynn Rene Anderson (September 26, 1947 – July 30, 2015) was an American country music singer known for a string of hits throughout the late 1960s, 1970s and 1980s, most notably her 1970 worldwide hit "(I Never Promised You A) Rose Garden." Anderson's crossover appeal and regular exposure on national television helped her to become one of the most popular and successful country singers of the 1970s. Anderson charted 12 No. 1, 18 Top 10, and more than 50 Top 40 hit singles. In addition to being named "Top Female Vocalist" by the Academy of Country Music (ACM) twice and "Female Vocalist of the Year" by the Country Music Association (CMA), Anderson won a Grammy Award (earning seven nominations), People's Choice Award and an American Music Award (AMA). She was the #13 artist of the 1970s according to Joel Whitburn's "Billboard Hot Country Singles" book and the highest ranking artist of the list not yet in the Country Music Hall of Fame. Anderson was the first female country artist to win the American Music Award (in 1974), as well as the first to headline and sellout Madison Square Garden that same year. Anderson debuted in 1966, at the age of 19, and had her first hit with Ride, Ride, Ride. After a series of Top 10 hit singles on the country charts during the late 1960s, Anderson signed with Columbia Records in 1970. Under Columbia, she had her most successful string of hits. Her signature song, "(I Never Promised You A) Rose Garden," remains one of the biggest selling country crossover hits of all time. In addition to topping the U.S. country charts for five weeks, the song reached No. 3 on the Billboard Pop Chart. It also topped the charts in several countries around the globe, an unprecedented achievement at the time. CMT ranks "Rose Garden" at No. 83 on its list of the "100 Greatest Songs in Country Music History". Anderson continued to record and remained a popular concert attraction until her death, regularly headlining major casino showrooms, performing arts centers and theaters. Although she was recorded as having been born in South Dakota, Anderson, according to family history, was actually born just north of the US border in Winnipeg, Canada, and the birth was recorded in Grand Forks so that she would gain US citizenship. She was later raised in Fair Oaks, California. She was the daughter of country music songwriters Casey and Liz Anderson. Lynn Anderson's great-grandfather was born in Aremark, Norway. In later life, Anderson met her Norwegian relatives through the Norwegian TV series Tore på sporet. In 1965, she was working as a secretary at Top 40 radio station KROY in Sacramento, California, when one of her mother's compositions, "All My Friends Are Gonna Be Strangers", was recorded by Merle Haggard and became a No. 10 country hit. Her mother signed with RCA Victor as a country music recording artist that year. While accompanying her mother to Nashville, Anderson participated in an informal sing-along in a hotel room with country stars Merle Haggard and Freddie Hart. One of the people present at the sing-along, Slim Williamson, owned Chart Records, a local record label. Williamson recognized Lynn Anderson's talent and invited her to record for his label. She began recording for Chart in 1966. Her sorrel quarter horses "Lady Phase" and "Skipster’s Chief" were produced as plastic models by Breyer Animal Creations. "Skipster’s Chief" was also the poster horse for the North American Riding for the Handicapped Association. Anderson died on July 30, 2015 at the Vanderbilt University Medical Center in Nashville, Tennessee from a heart attack at the age of 67. She had been briefly hospitalized due to pneumonia after vacationing in Italy. ↑ "Lynn Anderson i All sang på grensen". YouTube. 2008-09-13. Retrieved 2012-05-01. ↑ Kosser, Michael (2006). In How Nashville Became Music City, U.S.A. Trade Book Editorial Offices. Milwaukee, WI: Hal Leonard Corporation. pg. 135. 1 2 3 Biography: Lynn Anderson CMT.com; retrieved 7-6-08. ↑ "Lynn Anderson, Country Star Behind 'Rose Garden,' Dies at 67". Billboard. Retrieved 2015-08-10. ↑ "Billboard - Google Books". Books.google.co.uk. 1986-10-11. Retrieved 2015-08-01. ↑ Whitburn, Joel (2008). Hot Country Songs 1944 to 2008. Record Research, Inc. ISBN 0-89820-177-2. ↑ Anderson honored for musical achievements CMT.com; CMT news & updates; retrieved 7-608. ↑ "Lynn Anderson Remembered by Martina McBride, Travis Tritt & More Country Stars". Billboard. Retrieved 2015-08-01. 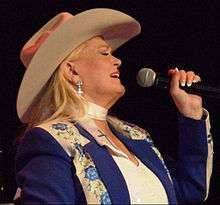 ↑ Terri Clark Opening CMA Music Festival CMT.com news & updates for Lynn Anderson, news from May 2007; retrieved 7-6-08. ↑ Lynn Anderson, Center Sound Productions website "Lynn Anderson Bridges album with Center Sound Productions; retrieved 5-30-15. ↑ Welch, Bob (2015-05-29). "At Home with Lynn Anderson". American Cowboy. Retrieved 2015-08-01. ↑ "Lynn Anderson, Grammy Award Winner, Top Female Vocalist, Rose Garden". Lynnandersonshow.com. Retrieved 2015-08-01. ↑ Country Legend Lynn Anderson Dead at 67. Rolling Stone. Retrieved July 31, 2015. ↑ Moments By Moser (2009-11-30). "Moments By Moser: INTERVIEW: Lynn Anderson". Momentsbymoser.blogspot.co.uk. Retrieved 2015-08-01. ↑ Lynn Anderson Charged With DWI CMT.com news CMT news from December 3, 2004; retrieved 07-06-08. ↑ Anderson, Lynn. "Anderson Arrested for Shoplifting". GAC News. Retrieved 13 September 2014. ↑ Lynn Anderson Arrested on DUI Charge CMT.com; news & updates (from May 4, 2006); retrieved 7-6-08. ↑ Anderson, Lynn. "Anderson Arrested for DUI and Civil Consent". Nashville.gov. Retrieved 13 September 2014. ↑ Tamburin, Adam (2014-09-12). "Country legend Lynn Anderson charged with DUI". Usatoday.com. Retrieved 2015-08-01. ↑ Anderson, Lynn. "Lynn Anderson's Arrest Record". NNDB. Retrieved 13 September 2014. ↑ "'Rose Garden' singer Lynn Anderson dies at 67". Tennessean.com. Retrieved July 31, 2015. ↑ Lynn Anderson awards CMT.com; retrieved 7-6-08. ↑ "lynn". Center Sound Productions. 2015-06-09. Retrieved 2015-08-10.